Cook the pasta in a large saucepan of salted boiling water for 8–10 minutes or until al dente, adding the peas in the last 30 seconds. Drain, reserving 1½ cups (375ml) of the cooking water and set aside. 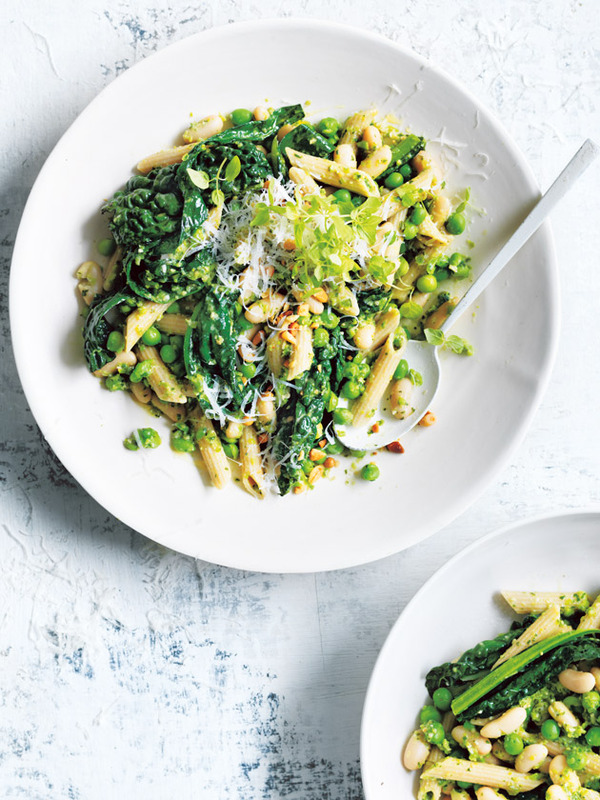 While the pasta is cooking, make the pea and mint pesto. Place the peas, mint, onion, water, pine nuts, parmesan, salt and pepper in a small food processor and process until smooth. Heat the oil in the saucepan over high heat. Add the garlic and beans and cook, stirring occasionally, for 5 minutes. Add the cavolo nero and cook for a further 1–2 minutes or until slightly wilted. Add the pasta, pesto and reserved cooking water to the saucepan and gently toss to combine. Top with mint, extra parmesan and extra pine nuts to serve. Serves 4.